"Diffusion of Innovation (DOI) Theory, developed by E.M. Rogers in 1962, is one of the oldest social science theories. It originated in communication to explain how, over time, an idea or product gains momentum and diffuses (or spreads) through a specific population or social system. The end result of this diffusion is that people, as part of a social system, adopt a new idea, behavior, or product. Adoption means that a person does something differently than what they had previously (i.e., purchase or use a new product, acquire and perform a new behavior, etc.). The key to adoption is that the person must perceive the idea, behavior, or product as new or innovative. It is through this that diffusion is possible. Adoption of a new idea, behavior, or product (i.e., "innovation") does not happen simultaneously in a social system; rather it is a process whereby some people are more apt to adopt the innovation than others. Researchers have found that people who adopt an innovation early have different characteristics than people who adopt an innovation later. When promoting an innovation to a target population, it is important to understand the characteristics of the target population that will help or hinder adoption of the innovation. There are five established adopter categories, and while the majority of the general population tends to fall in the middle categories, it is still necessary to understand the characteristics of the target population. When promoting an innovation, there are different strategies used to appeal to the different adopter categories." "The stages by which a person adopts an innovation, and whereby diffusion is accomplished, include awareness of the need for an innovation, decision to adopt (or reject) the innovation, initial use of the innovation to test it, and continued use of the innovation. There are five main factors that influence adoption of an innovation, and each of these factors is at play to a different extent in the five adopter categories." "Diffusion research examines how ideas are spread among groups of people. Diffusion goes beyond the two-step flow theory, centering on the conditions that increase or decrease the likelihood that an innovation, a new idea, product or practice, will be adopted by members of a given culture. In multi-step diffusion, the opinion leader still exerts a large influence on the behavior of individuals, called adopters, but there are also other intermediaries between the media and the audience's decision-making. One intermediary is the change agent, someone who encourages an opinion leader to adopt or reject an innovation (Infante, Rancer, & Womack, 1997). Innovations are not adopted by all individuals in a social system at the same time. Instead, they tend to adopt in a time sequence, and can be classified into adopter categories based upon how long it takes for them to begin using the new idea. Practically speaking, it's very useful for a change agent to be able to identify which category certain individuals belong to, since the short-term goal of most change agents is to facilitate the adoption of an innovation. Adoption of a new idea is caused by human interaction through interpersonal networks. If the initial adopter of an innovation discusses it with two members of a given social system, and these two become adopters who pass the innovation along to two peers, and so on, the resulting distribution follows a binomial expansion. 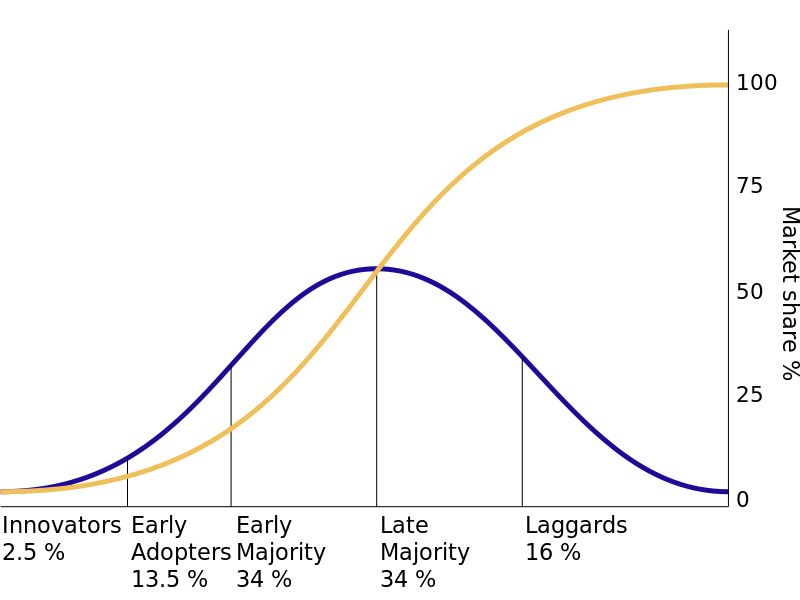 Expect adopter distributions to follow a bell-shaped curve over time (Rogers, 1971)."